It all started with direct mail. Today, we connect with customers online and offline, and the information businesses collect has increased exponentially. The volume, velocity, variety and complexity of all this information has created the era of what experts call "big data." 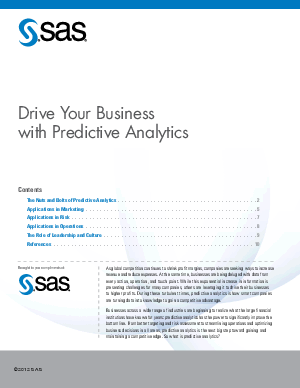 Predictive analytics help harness this influx of information and use it to create a competitive advantage. This paper defines predictive analytics, then details ways this type of analytics can be applied to marketing, risk, operations and more. It also includes information relevant to a wide variety of industries - from manufacturing to hospitals.